Here’s the general aviation (GA) statistics for the state owned airports in Finland and year over year change. Also the Helsinki-Malmi Airport EFHF is included in this table even the airport has been operated by a non-profit association since 1st of January 2017. Despite the fact that the state owned flight school Patria moved from Malmi to Tampere-Pirkkala Malmi is indicating a growth of 6 %. The numbers in this table are based on the calculation method used by the Finavia. 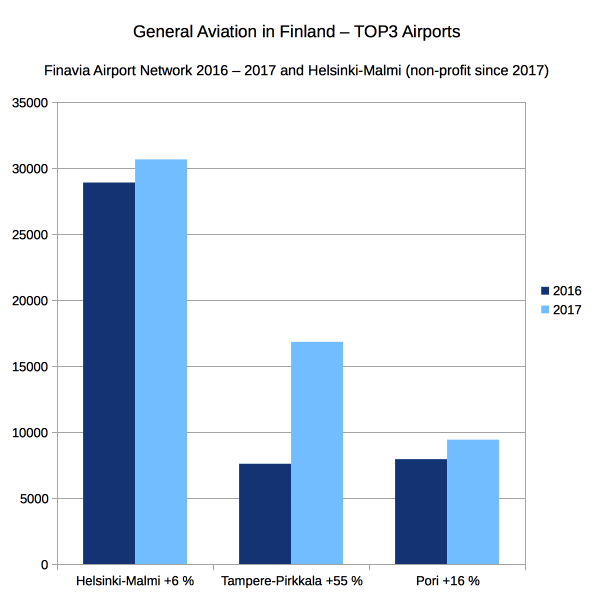 For the Helsinki-Malmi Airport the statistics are also available since 1st of January 2017 in the format endorsed by International Civil Aviation Organization ICAO. By using the internationally accepted method the number of operations at Malmi is 40.187 in 2017. The airport at Malmi is currently scheduled to be closed in 2019 without any real alternative in the Helsinki Region. The airport has also been chosen as one of the seven most endangered cultural heritage sites in Europe by Europa Nostra as it is the best preserved 1930s airport in the Europe. ** Growth at Kemi-Tornio and change at Oulu is related: The Oulu Airport (EFOU) was closed for maintenance in Summer 2017.